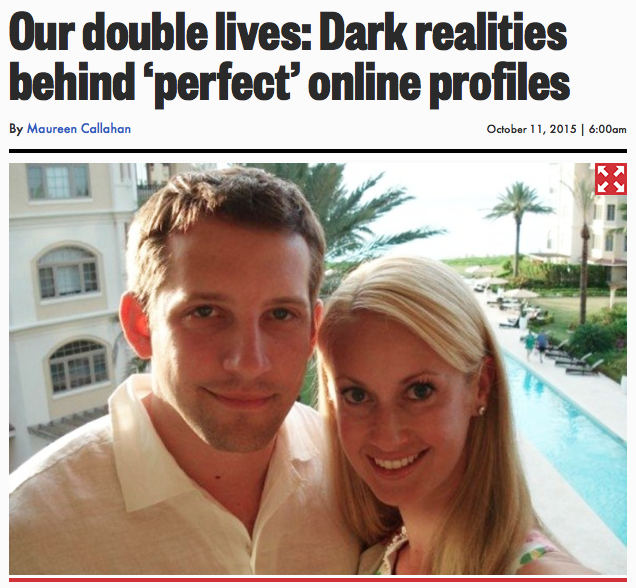 Recently, I read this article from the NY Post about how people tend to cultivate and present the "perfect life" online, while in reality their lives are very different. Often, their lives are a mess. I highly recommend reading it. While most of us may think the conclusions are obvious, it's important to consider that many people don't realize how staged online personas can be. It got me thinking. I try very hard to post honestly about my life, but I know what I present online is curated. The main reason for that isn't that I want people to envy me; I simply feel there are a lot of things I can't talk about because of my job. In the past, students have come across my blog and I have no way of knowing how often they visit, or if their parents stop by. I do know that a significant number of them follow my Instagram. My actual life: watching John Oliver with Matt. Definitely not glamorous. In real life, I eat a lot of junk food. My language is not child-friendly. I avoid socialization whenever possible, and I suffer from the kind of anxiety that makes me hide in my own house if there's someone at the door, and the kind of OCD that causes me to turn the car around to check that I've closed to garage door after I've left the house. I literally hid in the bedroom until Matt got home and could check that the guy was gone. I don't photoshop pictures, but I choose the most flattering ones to share, and I do adjust the lighting. When I take running photos, I'm careful to get some greenery in the background, because I mostly run in ugly areas. Real sweat, real face...real sorority arm for extra-flattering pose. Also, the trees and grass below me are flanked by highways on either side and will likely be bulldozed in the next couple weeks as a new housing development goes up. I don't think I put too much effort into trying to make my life look perfect because I'm usually happy to find joy in little things, and there's nothing I like more than some down time. My life may not be exciting, but I'm pretty happy with it! Now that I think about it, I can say I'm honest about my life online! And if we're friends on Facebook, you know the real me pretty well: I'm blunt, political, sarcastic, and opinionated. Hm. Maybe it's best that I keep some things off social media! How honestly do you portray your life on your blog? How carefully do you curate your presence on Instagram or other social media? "In real life, I eat a lot of junk food. My language is not child-friendly. I avoid socialization whenever possible" <--- me to a "T"! I think we all highlight the good things in our life and sometimes leave out the bad. I do not lie - but I don't post the bad "stuff". On Facebook or Instagram, I post about the things I am doing (or what I'm eating, haha) if it seems interesting. I also am not one to post things like " I am so blessed because my life is SO GREAT". I don't necessarily think people want to see that, either. In the pictures I post, sure - I take a million before I find that one perfect one and I do change the lighting or add a filter, but I don't go and straight up Photoshop me doing things I did not actually do!! I wonder if people really do that for social media purposes!?!?! I definitely avoid gushing over how "blessed and perfect" my life is, because that would be so false! I often wonder what attracts people to accounts that overuse that kind of enthusiasm. I've definitely heard of people photoshopping themselves into fantastic adventures, but most often I think they use it to adjust their bodies and faces to portray that kind of "perfection" their followers want to see. I am cautious about what I post. I don't post when I am out of town - until I am almost home, or home. I pick the best pictures, too. I will photoshop out a horrendous zit. I don't post other people's business. I can't post about work. Sometimes I post about issues but am vague - a lot of irl people read my blog and I have to be careful. I keep my issues off of Facebook, and mostly off the blog - I'd rather work those out with my partner or a friend! I don't get the people who post constantly negative stuff, either. I think we all go through negative times and it's good to share that, but I think it's important to put a realistic or hopeful spin on it...it helps us move forward, I think! I avoid posting if I'm out of town, too. I try to keep where I live and where I travel fairly vague. I can't wait to read the article! I think you are very real on your blog and on Facebook. I wouldn't be interested in reading about someone's life in they only posted the "good" stuff. I enjoy reading about a real person who has real struggles just like we all do! As far as my blog, I think I am very similar to you. I do pick the most flattering photos but do not alter them. I would share more about work struggles but obviously can't. I could rant and tell funny stories about my piano students but that wouldn't be professional. I don't go too deep into Paul's health because I don't want it to be the "my husband has a brain tumor blog". And while that's a big part of our life, we try not to make it the ONLY part of our life. We do lots of fun things and think about other stuff all the time. 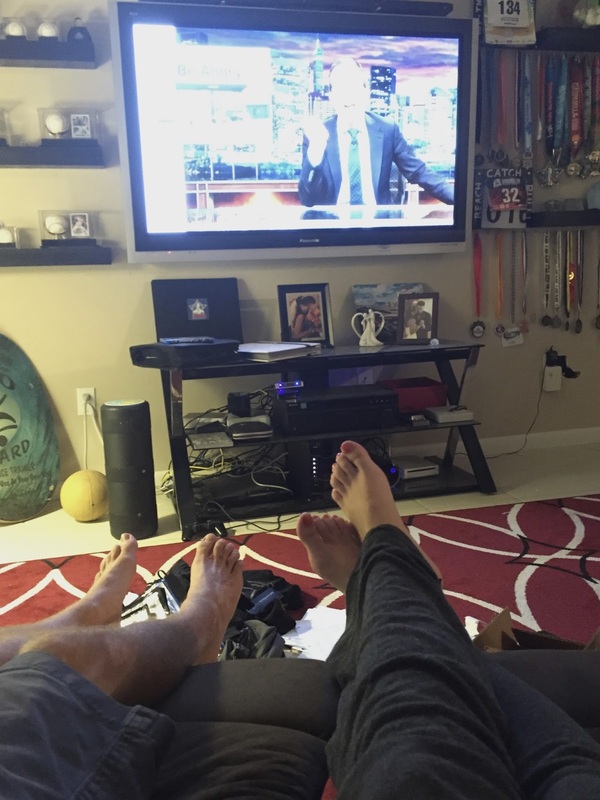 I think you and Matt are a lot like Paul and I- chilling on the couch and watching TV is so simple yet it makes us really happy! We laugh at the same stuff and it is just fun to sit next to each other and spend time together. I agree - I'm much more attracted to real accounts. But I wonder how many of those "real" accounts are actually edited or falsified in some way! I think the blogs I like most are the ones that I can really identify with, too. It's why I like your blog so much! The best blogs are the ones that introduce you to people you'd LIKE to actually hang out with in real life! Oh man, so much of this rings true. It's also part of why I have't been using a lot of personal pictures. I'm actively on the academic job market, looking for and applying to tenure-track professorships. I know the search committees google me, and I want to make sure that what I present represents a version of me that I want prospective employers to see. Am I hiding anything major? No, not really. Like you I think I'm editing out the truly unflattering and the simply mundane: the stack of mail that needs to be sorted, the pimple on my chin, my attempt at a garden that went so poorly I've just given up and am letting the weeds take over. An unreasonable number of my photos contain junk food and/or alcohol. I hope people realize that is because I see them as treats and therefore posting pictures of it is akin to vacation photos or my dog being extra adorable. I don't live on donuts and bloody marys alone, ha! I kind of love Kristina's "day in the life" videos for this reason. They show more of the scene. I know they are still edited, but still. It's just comforting to see things like "today I sat in traffic for an hour and it was super frustrating" because guess what? Me too! That said, given the nature of my research-in-progress, if I made such a video I'd have to edit out most of my workday! yawn. Sometimes I worry I include too MUCH mundane stuff in my life on my blog! But sometimes things are just boring and nothing interesting is going on, so that's what I update about! It's kind of a reminder that I should attempt to have a life once in awhile haha. I definitely consider what I want my current or future employers to see, and that's one reason I keep my blog pretty clean. But at the same time, I don't want to completely avoid the digital world just so nothing controversial ever slips out, so I've tried to find what I think is an appropriate balance. It amazes me that people take the time to create faux selves. Of course I give thought into what I post on Facebook or on my blog, because I know people in the church congregation I work for see both, as do my parents, of course! And I'm careful about what I include about the kids. So I leave plenty of stuff out. But it would never occur to me to lie. Real life is too good - hard stuff and all - to demean it by making stuff up. I totally agree - it makes you wonder how unfulfilling their lives must be if they're willing to spend the time crafting a fake life. They could put that effort into making their real life into more of what they want! You definitely seem as real as it gets to me, which is why I love reading your blog! I know for me, it's easier to express myself through writing than speaking (I'm an awful speaker). I don't talk much about my job because it is somewhat of a high-security type of work (and probably boring to most lol!). I try to focus on the positive in general when I'm online because I know no one is interested in hearing my complaints. Now in real life, it's a different story! Oh, I think just that tidbit about your job sounds really intriguing!! But I understand the need for discretion. It's funny...I always consider teaching the #1 job that you have to watch what you post, but now that I think about it, I guess if you want job security, you have to be careful no matter where you work. In real life, I'm a big complainer. I've tried to rein that in and be a little more positive, but I'm naturally a pessimistic person. This is such an interesting topic and I feel I could say so much about it (I can't wait to read that article). I think it's important to remember that "curating" our image is not a new phenomenon, it's just getting a little more attention now. It's easy to blame social media, but people have always tried to highlight the good and hide the bad parts of life. The only difference now is that due to the internet everyone, not just celebs, has a stage so we are seeing this and being affected by it more often. I think all of this hinges on the difference between actually manufacturing an image versus simply being selective about what you share. Some degree of censorship is necessary - no one wants to hear EVERYTHING about another person's daily life. But it does seem like a fine line between using discretion and falling into a "keeping up with the Joneses" trap. Hm, I guess portraying that we live the ideal life isn't necessarily new...but we used to have a small audience. And in person, with friends, there's no need to hide the truth about our lives. So while I agree that maybe false portrayal isn't new - we dress to send a certain image to strangers, etc - I do think it's at a whole new level now. I don't put as much thought into the purpose behind what I post as you seem to (based on your comment). I post for myself, whether that's to vent about something, ruminate on a topic, or whatever. Sometimes it means my posts are boring or predictable, or that they don't add anything really significant to my story. I rarely keep my audience in mind beyond omitting details I think could be problematic. Maybe I should think about what I post and why I post it, rather than just thinking about how what I post may reflect back on me! Adam has said before that I present a character of myself on the blog, which I think is a true and accurate assessment from his perspective. For the most part I think the version of me that I present on the blog combines the different personalities I display throughout the day. For instance Adam thinks I come off as bubblier and more positive than I am in real life on the blog. I think part of that is because I often write my blog posts during lunch time at work or soon after I get home from work. I think my work personality is different than my home personality because it has to be. My colleagues are 90% male and my clients are 95% male. Whether it's good or bad, over time I've constructed a work personality that has not only allowed me to climb the ladder professionally but also deal with men all day. I've found that men at work like me to have a strong, confident and happy personality 24/7. On the days when I am quiet or less bubbly male colleagues have asked me if I am okay... if something happened or if I'm feeling ill.
At home I display less of this upbeat personality because I don't have to be "on." Adam is someone I feel totally comfortable with sitting in silence or just watching sports on TV. There's also the factor that I'm pretty anti-social in real life. I don't go out with friends a lot. I don't even have a lot of friends, just a very small circle that I see infrequently because life has taken us in different directions. When I'm with my girlfriends I think a bubblier personality comes out of me (especially after a glass of wine). Adam is a very calm person and at home I probably adopt part of his personality and am much less excitable. On the blog I tend to abuse the exclamation point because I often write as if I'm talking to one of my girlfriends. I think that helps me write in a much more casual tone as apposed to the drier type of writing I often do at work. What a great prompt! This has definitely made me think a lot more about my blog personality and judging by the comments above it's been the same experience for a lot of other readers. Like other bloggers have mentioned there are things I purposefully keep off of the blog (usually politics) and definitely cursing. I sometimes curse on the blog but in real life I'm probably an over-the-top curser! Adam said when he first met me he was shocked at how often I use the F word lol! *** I should add that by demonstrating a strong and confident personality at work I think sometimes my colleagues forget I am a woman. I've been called "bro" a couple of times! I wonder if Hillary has ever been called bro? I love that you're a strong, confident woman in a male-dominated work environment. You're my hero! I think in a way I portray myself a little more positive than I am in real life. I tend to be pessimistic and, like I posted, a little more blunt and unapologetic than I am online. I guess I try to soften my persona a little on my blog so I don't come across too strong! I also don't want to be "on" at home; it's why I tend to just veg out instead of going out! I'm "on" all day, too. When I see friends, I tend to be more energetic. 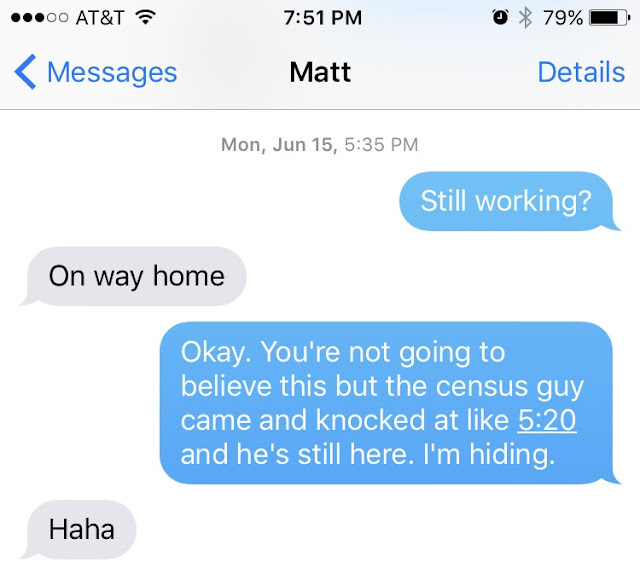 Matt is quieter in public, so I tend to help carry conversations when we're with friends, even though it doesn't come naturally to me. You get how it is! I feel like Hillary being called bro would be one of the more positive words she hears from some of her male colleagues in politics.